Hello beautiful people, happy new month. I pray August will be good to us all. I bought this Ankara shirt dress from Abike's stylin on Instagram but unfortunately did not check their size chart so I ended up with a dress that doesn't fit *sigh. I love the print and the style of the dress and had to find a way around styling the dress so I wore it over this body con dress from boohoo. Styled it with bag from Asos, garnished it with Check shoes from the shopper's haven on instagram and added a little pizazz with the glasses I bought from a street vendor in Abuja traffic for a whooping sum of 500 naira....not bad! I decided to make the best of what would have other wise been a bad situation.The outcome is quite neat even if I say so myself. Give whatever you have at hand your best shot, it may just God's way of preparing you for bigger and better opportunities.....you may not see it now but in future you will be grateful for that 'wilderness' experience. 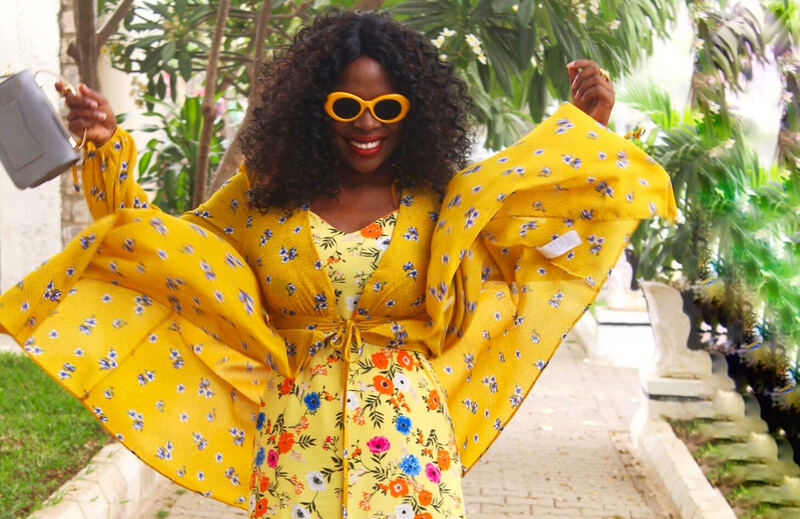 I rocked my 'little' dress to work on a Wednesday.....I made lemonade out of my lemon plus I even got a blog post from that very mundane experience....talk about a win win situation. Abike styling is an online Ready to wear store,they stock fabulous and vibrant ankara pieces at very affordable prices....I think this dress was 5000 Naira. What do you think of the dress and styling? How have you been coping with 'life' ?